Summary: Maya has been cursed by the stars, fated to be married to death and destruction, which makes her an outcast among the members of her father's harem and an undesirable match for, well, anyone. And actually, that's fine with Maya, who prefers reading and star-gazing over marriage anyway. Until Amar, Raja of Akaran, shows up asking for her hand. She has never heard of him or his land, but given no other choice, she accepts, and quickly learns that his land is no ordinary land, but a magical one, and Amar is the king who holds the balance of the universe in his hands. Promised equality and power, Maya also quickly learns that Amar's world, and Amar himself, is full of secrets, some of them dangerous. There are strange sounds in the night, and strange doors that must never be unlocked. As she begins to unravel some of the mysteries of her new home, she also begins to question her trust in her new husband, and a fatal mistake sends her hurtling through worlds and past lives in order to make everything right again. 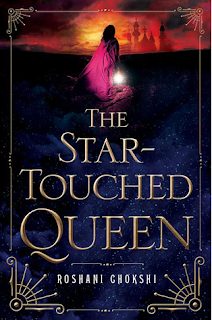 Thoughts: Full disclosure - I was a little ways into this book when I decided to read ACOMAF instead, and I didn't pick this up again for almost a full week after I'd finished ACOMAF because I was deep in the throes of book hangover. So my reading of this book was a little distracted, to say the least. THAT SAID, I still really liked this book. It is beautiful and poetic, rife with lush descriptions of magical worlds and mythology. I have a distinct feeling that I will like this book even more upon rereading - there were lots of elements that reminded me of Night Circus. I wish I knew more about various Indian-based myths, to better understand the significance of some of the figures that come up in the story. The love story might make you roll your eyes, because it feels very insta-love. There is an actual reason for it that gets revealed later in the book, though, so if you really hate that sort of thing, just know that it gets explained. But even so, I definitely felt like there was a distinctly seductive quality to Amar, so I wouldn't be too judgey even if it were just plain insta-love. I found myself wanting more and more scenes of the two of them together, and when THE THING happens, I felt pretty heartbroken. It's a beautiful, epic fairy tale, and it looks like there will be a sequel (not to worry - no cliffhanger ending here). I highly recommend it, and I'm looking forward to reading more from Roshani Chokshi. *Correction* The sequel isn't actually a sequel, as this is a standalone novel. The second book will be about other characters from the story's universe.